1. 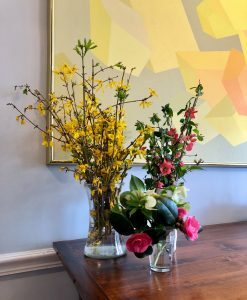 If you’d like to brighten your indoor space, trim a few branches of forsythia, spirea or flowering quince to create a beautiful flower arrangement. These plants bloom from February to May and will last inside for 3-6 days. There’s no secret recipe to crafting the perfect bouquet – cut as much as you like and enjoy the sight! 2. 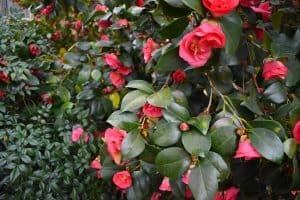 The beginning of spring means the time is ripe to accomplish heavy pruning to your hollies and yaupons. 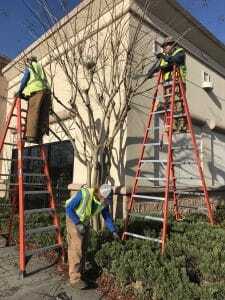 If you would like to lower the height or reshape the plant, we encourage you to grab your gloves or give us a call. We’d be thrilled to provide a few expert tips on how to tackle this yourself or discuss how we can assist you. 3. 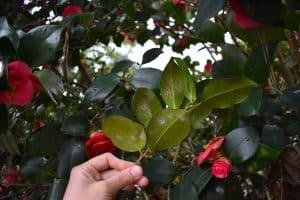 As the weather warms up, keep your eye out for those pesky scale insects that invade camellias (pictured below) and lace bugs that hook onto azaleas. 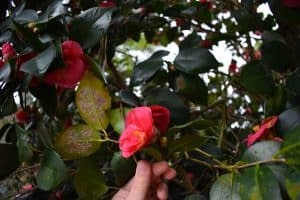 To identify scale insects, look for discoloration on the leaves. The leaf will turn a patchy yellow color and the underside may appear moldy. On azaleas, lace bugs will make the leaves spotted like black or beige grains of sand. Sometimes they profusely cover the leaves, but at other times, they start on one end and work their way up. On both plants, the flower will remain unaffected. There’s no way to predict how long these bugs may last, so we advise you to check every 2-3 weeks as a precautionary measure. If you identify either, contact us immediately to prevent further damage. Before long, your neighbor’s Star Magnolia or forsythia will begin to bloom and we both know what that means. Let us help you freshen up your curb appeal for the start of spring! We can install new color, replace old plants or add extra pine straw or mulch to your beds. With April on the horizon, our schedule is tightening by the hour. So, let your Maintenance Account Manager know how we can help today!